French sculptor; born at La Ferté-sous-Jouarre, in the department of Seine-et-Marne, France, 1818; died in Paris, April 29, 1881. Adam-Salomon was intended for a mercantile career, which he followed for some time at Fontainebleau; but he afterward entered the factory of Jacob Petit as modeler, a calling for which he had shown talent in his youth. He was sent by the authorities of his department with a scholarship to Paris, where he studied sculpture thoroughly; and then, to perfect himself in his art, he traveled in Switzerland and England. The bust of Béranger which he produced at once established his reputation, and was repeatedly copied. It is said that, as the poet declined to sit for him, he modeled the features from memory. 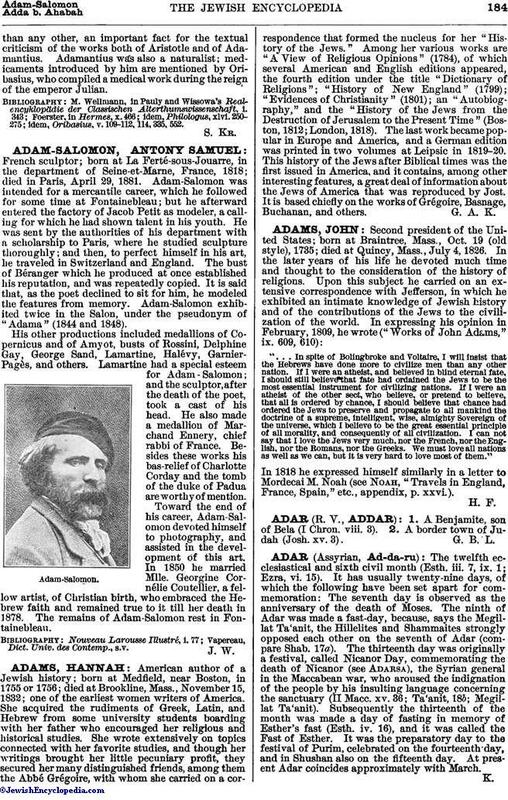 Adam-Salomon exhibited twice in the Salon, under the pseudonym of "Adama" (1844 and 1848). His other productions included medallions of Copernicus and of Amyot, busts of Rossini, Delphine Gay, George Sand, Lamartine, Halévy, Garnier-Pagès, and others. Lamartine had a special esteem for Adam-Salomon; and the sculptor, after the death of the poet, took a cast of his head. He also made a medallion of Marchand Ennery, chief rabbi of France. Besides these works his bas-relief of Charlotte Corday and the tomb of the duke of Padua are worthy of mention. Toward the end of his career, Adam-Salomon devoted himself to photography, and assisted in the development of this art. In 1850 he married Mlle. Georgine Cornélie Coutellier, a fellow artist, of Christian birth, who embraced the Hebrew faith and remained true to it till her death in 1878. The remains of Adam-Salomon rest in Fontainebleau. Vapereau, Dict. Univ. des Contemp., s.v.